As much as possible, I try to allow my children to make their own choices and be their own people. If my 6-year-old daughter wants to wear plaid, paisley, and polka dots all together, that’s fine with me. If her twin brother wants to throw on snow boots over footie jammies and go outside to play in the snowy pre-breakfast darkness of a winter morning, no problem. If the littlest one insists on dressing her stuffed dog in pajamas and sleeping with her Halloween costume every night, it’s A-OK by me. But there is one thing on which I will not waiver. They will, all three, be skiers. This means, of course, that I have been paying my ski mom dues over the last several winters. For the most part, I’m OK with that, even as I long for the freedom and pure bliss of a powder day all my own. C'mon, Mom. The glades are waiting! In our family, skiing is simply a part of life. A really good part of life. Other than my first couple years on this planet, when I was still mastering walking, plus the two winters I was massively pregnant, I have spent a good bit of each winter on a mountain, with skis strapped to my feet. My parents met while skiing at Cannon Mountain. My brothers and I learned to ski there. My husband and I spent a good part of our early courtship on the slopes. I missed the New Hampshire mountains when I moved to the foothills of upstate New York for college – so much so that I fled west to the Colorado Rockies after graduation and stayed in those high peaks for five years. Winter means skiing, and it always has. For much of the last five years, winter has meant – for me – skiing slowly backwards, or with a small child clutching my legs, or while holding the tethers of a kid’s ski harness. I have spent much more time on the bunny hill than I have on the steep stuff or in the powder. On the rare occasion that I am able to sneak in a few adult-only runs, I often forget my poles, having become so accustomed to skiing without them, in order to have my hands free for lifting a kid onto the lift or adjusting small mittens or helping little ski boots click into bindings. The ski moms and dads among you will understand this – the constant tug-o-war between wanting to ditch the kids at Grandma’s house for a day of real skiing and knowing that the more time you spend progressing from bunny slope to blue trails and beyond, the sooner your kids will be right there with you on the powder days. People often say to me, “Just wait a few years, and you won’t be able to keep up.” I’m pretty confident in my skiing ability, and I can keep up with most people. But, yeah, that’s the goal – that I’ll have to push it to ski with my kids. That someday in the not-too-distant future, they’ll be the ones waiting for me at the bottom of the run. For a few painful days when my older two were 3 years old and in their first ski season without a harness, I thought I would die of frustration before they learned to turn or stop on their own. Then one day, magically, they got it, and there’s been no looking back since. This winter, finally, I can taste the skiing freedom soon to come. 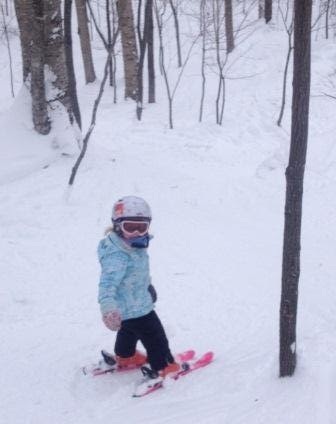 My kids, ages 6 and almost 4, are skiing faster and better. They confidently ski all the intermediate trails that are familiar to them and are starting to be comfortable in skiing adventures further afield than the Tuckerbrook Chairlift. They lead me through kid-sized glades and hurl themselves gleefully over the jumps in the mini park. Already, my kids are becoming my favorite ski buddies. I’ve even started skiing with my poles again, because my little rippers are becoming self-sufficient on the slopes. I don’t always get to ski my favorite runs with them, and I certainly don’t get to go as fast as I’d like. But their joy is contagious. Their love of skiing warms a ski mom’s snow-loving heart. I don’t care if my kids become ski racers, although if they want to, that’s fine. I don’t expect them to compete in the Olympics in 2026. I will miss them if, a dozen or more years from now, any of them decides to head 2,000 miles west – as I did as a 20-something – and pursue a life of ski bum happiness in a Rocky Mountain town. But you can bet that if they do, I’ll be out there to ski every winter. I just hope they don’t mind waiting for me at the bottom. Original content by Meghan McCarthy McPhaul, published on her Blog: Writings from a full life. I completely related to this having gone through the very same rich experience myself with my two children. The transitions from harness to "ripping" it over the jumps and through the woods is a true heart warmer. I had a tear in my eye at the end of this one; nicely written! Thanks, Melissa... and thanks for helping my two "big" little rippers have fun and go faster this winter! As you know, I've been there with my kids and most of my grandchildren. It's wonderful to see them skiing off with the confidence that we help them get after a few falls and big hugs!